This week we have discussed multiple cultural views of place, and how recognizing those views can help us care for places, and in turn, work towards positive social and environmental change. Students of the Understanding Place class should post a comment here reflecting on the importance of cultural lenses in their understanding of that place. This week we have thought about how observing and experiencing place through different spatial scales can help us care for places, and in turn, work towards positive social and environmental change. Students of the Understanding Place class should post a comment here reflecting on the importance of spatial scales in their understanding of that place. This week we have thought about how observing and experiencing place through different time scales can help us care for places, and in turn, work towards positive social and environmental change. Students of the Understanding Place class should post a comment here, each briefly describing a chosen place that they know well, and then reflecting on the importance of temporal scales in their understanding of that place. SoE Summer 2017, here we come! The SoE is off to a great start! 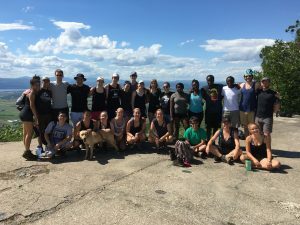 Twenty-four students have arrived and are already delving deep into their classes with returning faculty; participating in workshops on communication styles and teaming; and having lunch with practitioners like Middlebury’s president, Laurie Patton. We took a great hike up Snake Mountain and are looking forward to the exciting, integrative weeks to come. Students in this year’s Understanding Place course will be exploring a shared place — the Otter Creek watershed — and a place of their own through several lenses in order to build a toolkit that will allow them to better understand any place. That toolkit will, in turn, allow students to teach others about the importance of understanding place while working towards positive social and environmental change. Below under the “Comments” section of this post you will find ongoing reflections about the place that each student has chosen, written in light of their readings, discussions, and activities from each week. Over the last two weeks, we’ve explored place in light of temporal time scales and land use, for example through GIS exercises and readings from Foley et al., Matson et al., and Wendell Berry’s ‘Let the Farm Judge’. For this week’s reflection (due Wednesday at noon) please choose a place and describe its dominant historical and current land use(s). Based on local and global land-use trends, what do you think the future of land use in that place might be over the next 100 years (e.g., suburban development, agriculture, urbanization, industry, conservation, etc.)? What do you suggest might be the most suitable future land use(s) in that place in light of ecology, society, and economy? For the last three weeks we have been building up our ‘toolkit’ for understanding place, with a special focus on agriculture. Please share how you envision your contribution to the final group project – the recipe book. Please include specific details including the kind of contribution you’d like to create or share, what disciplinary or life-experience background(s) you could contribute through your work, and what ‘tools’ for understanding place might be expressed through your contribution. Finally, please briefly note how your proposed contribution applies to our shared place at the SoE or to a place that is special to you, and also how it can be applied to any place. Your answers to this reflection are not set in stone, and you are free to change your contributions to the final project as we progress through the second half of the semester. This is simply a forum for you to brainstorm, be creative, and share your ideas with your peers. Provide your reflections as a comment to this post, and remember that your comments are public. Many of our discussions and experiences this week revolved around justice and action. Use a concrete example to explain how a better understanding of place can enhance social and environmental justice. Welcome, all students, to the 2015 SoE! We shared a great hike up Snake Mountain and a beautiful, moving opening ceremony last weekend, and we are all very excited about the next six weeks. Now it’s time to dive into our work! We have been exploring definitions, perceptions, and perspectives of ‘place’ this week in the Understanding Place course. Please describe two concepts or experiences you have discovered this week, and how they have contributed to your understanding of place. Also, share one still unanswered question or concern that this week’s classes and/or readings have raised for you. 三道茶 (three-course tea): This is life.